Yesterday was my first full day back in Plymouth following a great trip to London for the The Allergy and Free From Show 2014. The show was held at London Olympia, as it was last year, but this year it moved to the larger Grand Hall following some overcrowding at the previous show. I set off from Plymouth on Thursday afternoon to meet my wife, Abby, who was travelling back from working in France. I met her at Kings Cross which gave us chance to pop round the corner and visit the Kings Cross branch of Honest Burgers. Amazing burger as always, and washed down with a gluten free beer. We had decided to visit the show on Friday this year, in the hope that it would be a bit quieter than the previous year when we’d visited on Saturday and it was carnage. We arrived at 10:20, expecting to join a long queue but were pleasantly surprised to find the doors had opened a little early and we were able to walk straight in. On entry we were given a guide book, along with a bag and a pack of toaster pastries from this years sponsors Udi’s Gluten Free. Our first stop was of course to see friends Ann and Steve on the always colourful Perkier Foods stand. It was good to see them before it got busy so we had a chance to chat. The calm before the storm I am sure! I stocked up on my favourite Rocky Road tubs and golden syrup porridge pots. Two of my favourites from the Perkier range and of course the ones that Sainsbury’s do not stock. Here I am pictured with Ann (centre) and Twitter friend Flo Bistrow who I finally met here. On the way in to the show was a huge Udi’s Gluten Free stand, and they were sampling their new Oreo style cookies and Tiger Bread. The cookies were delicious but I wasn’t particularly impressed with the tiger bread, which was a little dry. Maybe I had been a little spoiled on that front by the excellent tiger bread by The Wheat Free Bakery that I had managed to get my hands on at Clare’s Gluten Free in Plymouth recently. 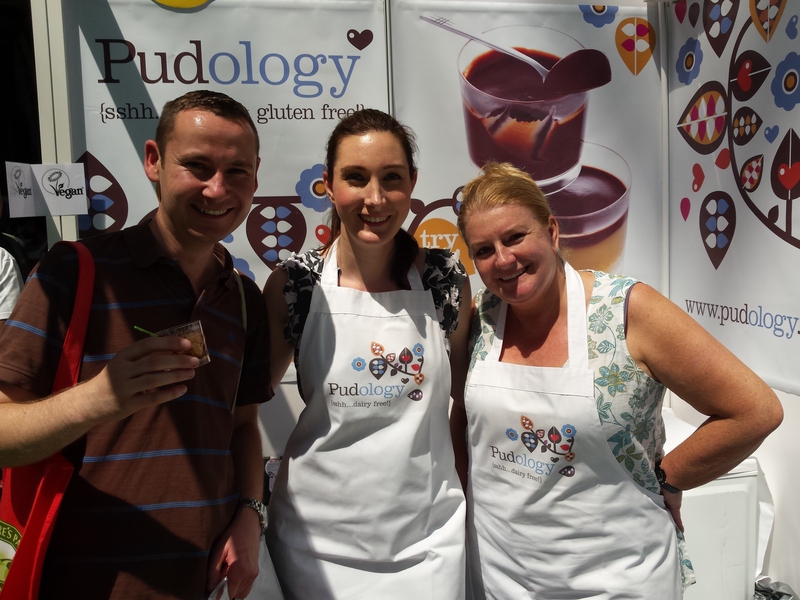 Next I had a chat with Peggy from Glamour Puds. 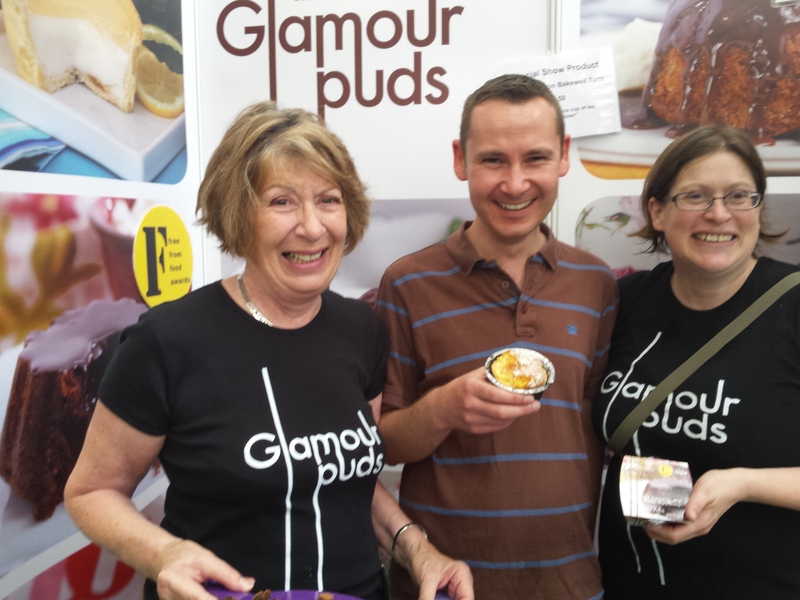 We’d spoken on Facebook a couple of times when Glamour Puds was just launching so it was good to be able to put a face to the name. It was also good to be able to have a taste of these puds again as I was extremely impressed on the previous occasion that I’d managed to try one. Thanks to Peggy who gave me a few freebies to take away. The good news is that these puds are now available in the chilled section at Tesco so do give them a try. They are dairy free as well as gluten free. Much of my time at the show was spent catching up with contacts I had made in the Free From community over the last couple of years. Between the bigger hall and coming on the quieter day, there was much more opportunity to have a chat with the stall holders this year. It was good to chat with Nick and Martin of Celia Lager, not to mention stock up on some beers. Unfortunately getting my hands on 6 beers at the start of the show was a complete school boy error and I should have bought them at the end instead of carrying them around with me all day! 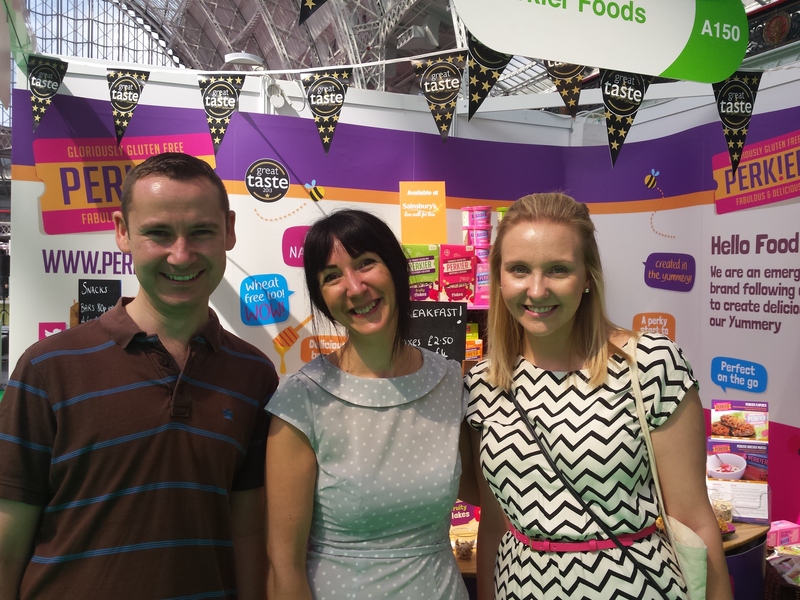 I also enjoyed catching up with Sean on the Live Gluten Free stand, Monika from Fria and Alex and Michelle on the FoodsMatter stand. In fact I spend pretty much the whole day bumping in to people that I know from Facebook and Twitter land, and this was probably the highlight for me. Several of us also had a blogger meet up in one of the cafes (oddly filled with non-free from cake). It always great to meet up with these guys and say hello to old friends and meet some new faces. To be honest I pretty much avoided the uninspired supermarket stands and also most of the big boys at the show. Nothing against the likes of Glutafin and Genius, but I’d visited their stands over the last few years and felt a bit like I’d been there and got the T-Shirt this time round. I preferred to spend my time focussing on the little guys to see what I could find. Of course there are a lot of people doing very similar things at the show so it can be very hard to stand out. Freego. A new online gluten free shop. I’ve recently ordered from them and they have lots of unusual GF products that I’d not see before. I love the product reviews on the website and it’s good to see that this online shop will actually deliver to Plymouth! Gluten Free by the Sea readers can get £10 off their first order of £20 on the site using the code “GFBYSEA10′ (exp 31/09). It was nice to say hello at the show. 1-2-3 Gluten Free. This one has really excited Abby, as they are based in her home town of Cleveland, Ohio. Being an American company they do some very traditional recipe mixes such as (American) biscuits and cornbread. The cake samples made with their mixes were excellent. They were at the show last year too, but it sounds like they are much closer to a UK launch now. I also stocked up on some Venice Bakery UK pizza bases, which were the highlight of last years show for me. I would say they were still one of the highlights this year and it really is a fantastic product that deserves wider availability, and it would indeed be a great product for any of the takeaway pizza chains to use. It was good to get my hands on some focaccia from the Free From Food Award overall winner Focaccia Per Tutti, and I’m looking forward to tucking in to that. I also picked up a few packs of the delicious chilli corn chips from Amaizin, really good. We spent six hours at the show but still think I missed half of it after reading other peoples recommendations on Twitter. There is so much to see and taste, the show was HUGE this year. I have been chatting to Abby and I think next year we may do Friday morning and then come back and finish on the Sunday. I think by the time we did the second half of the show we had tasted so many cakes and crackers it was hard for anyone to stand out and we were too full to even try some brands, and we didn’t give some of the smaller stands the attention they deserved as a result. I think it will be better if we can have a break in between and come back refreshed and ready to go again. This approach may also mean we can get away with buying some chilled products if we go home straight from the show. Just one thing I’d like to point out is that Ocado don’t deliver past Bristol and we don’t have Whole Foods in Plymouth. The amount of times I heard “we’re available in Ocado” on Friday, the heart sinks a little! Overall I enjoyed the show a lot more than last year. There was so much more room and the atmosphere was much more relaxed on the Friday, which was reflected by the fact we spent a whole six hours there. Great credit to the organisers for responding to last years issues. We didn’t see any gluten near misses this year with potential cross contamination, though it was a bit worrying that ASDA were giving out unlabelled samples. I also noted that I did get asked my dietary requirements when asking for samples a lot this year, good to see that more companies were on the ball in that respect. From a personal point of view, I’m probably getting less out of the stall holders due to my increased knowledge of the producers, and of course the fact I’m lucky enough to be sent samples regularly. This year I didn’t quite feel like the “kid in a sweet shop” that I did on my first visit, but we’ll still be back next year. It really was just fantastic to see everyone, and the rest was almost just a bonus. Friday evening Abby and I met a few other bloggers and tweeters for a fantastic meal, and not to mention a few cocktails, at Dishoom. 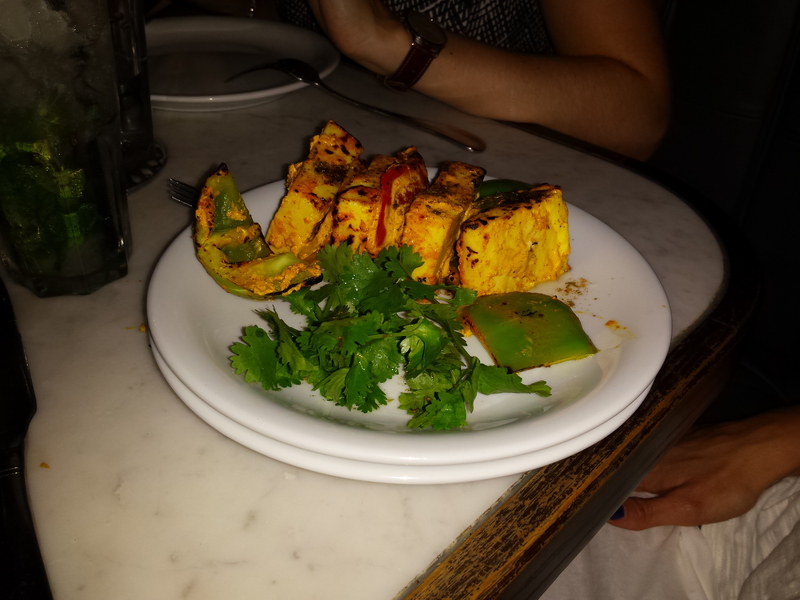 Both Abby and I were really impressed with the food at this Indian street food restaurant. There was a really good gluten free choice for us, and plenty of veggie options for Abby. The evening was made complete by great company and great cocktails, we will definitely be going back. I hope those that visited the show had a great time with lots of new discoveries. Please comment below with your favourite finds! For more photos from the show see my Facebook page. Delicious Allergen Friendly Soup from Soupy Do! Earlier this year I heard from Martyn Phipps who informed me he was setting up a new Plymouth based company, Soupy Do!, that would sell a range of freshly made soups. Not only that but all of the soups in his range were to be gluten free, dairy free, low in fat and vegetarian. In addition to that Martyn has since gone a step further and ensured that all of his soups are free from all 14 of the regulated allergens. A true free from experience! Soupy Do! produce seven flavours of soup which are; Carrot and Ginger, Continental Country, Italian Herb and Red Pepper, Spicy and Smokey Tomato, Super Green, Crimson King and finally Butternut, Cumin and mild chilli. Martyn was kind enough to drop around some samples of the carrot, tomato and butternut varieties. All three were packed full of flavour and quite spicy, which is right up my street. All of the produce used to make the soups is sourced locally in Devon and Cornwall where possible. 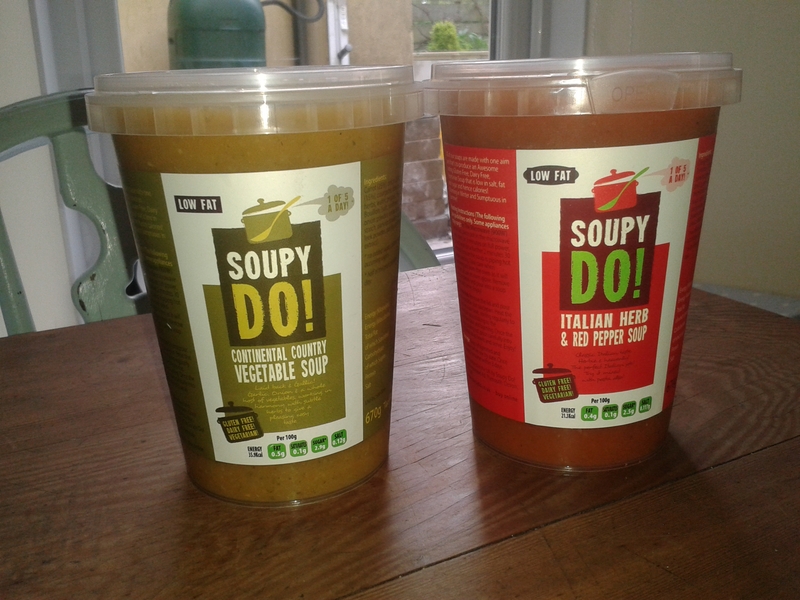 Some of you may have sampled these soups at the Coeliac UK Plymouth Group AGM where Soupy Do! were present selling on the day. The soups are available to buy in Plymouth and will be delivered by Martyn personally to your door. The delivery area has now been expanded to South Hams including Totnes, Dartmouth, Kingsbridge, Salcombe. Martyn is also currently investigating national delivery. Minimum order for delivery is 1kg, with a £1.50 charge for Plymouth delivery, increasing slightly with distance. I recently placed an order with Soupy Do! and I tried the Continental Country and Italian Herb and Red Pepper soups. I’m pleased to report that both were delicious and I can highly recommend them. They were milder than the first three flavours that I tried for those of you who are not as keen as me on spice. You will also be able to buy these soups at several local markets in and around Plymouth including the new local produce market at Mount Edgcumbe. Keep an eye on the Soupy Do! Facebook page for further details of other markets.